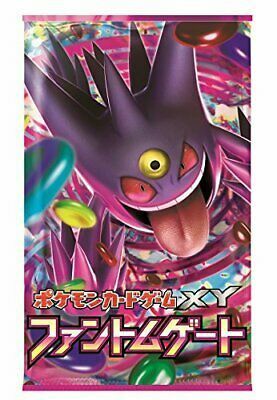 B00L9PR4GS Description Pokemon card game XY expansion pack phantom gate BOX Condition: NEW Brand: Pokemon (Pokemon) Subject Gender: unisex main manufacturing countries: Japan (C) 2014 Pokemon (C) 1995-2014 Nintendo / Creatures Inc./GAME FREAK inc. Payment We accept PayPal payment only. Please make a payment within 5 days after the purchase. Shipping - Shipping Worldwide!! Shipping Duration Shipping Method Asia North America Central America Middle East AU, NZ Europe Russia South America Africa Non-Registered Small Parcel 2 - 4 weeks 2 - 4 weeks 2 - 4 weeks 2 - 4 weeks Item below 2kg will be sent by airmail, so in average it takes around 12 days till delivery, 4 weeks at maximum. Item over 2kg will be sent by EMS. It takes around 5 days in average for delivery. Item including lithium battery is considered as dangerous object, so it will be built in main unit. We may not be able to send it to countries which prohibit importing lithium. Regarding tax, we will try not to get imposed, but if any fee is incurred, please kindly pay it at your side. Terms of Sale Return Policy We will accept the return of goods from you only when the product is in a state of unopened. And the buyer must pay the return shipping costs. After we received the returned goods, we will refund you the product price. We will not refund the postage that you paid for returning. This is because we already paid the postage for Japan Post. We will not refund to you when a returned product is broken, used or opened. And we will not accept return and refund with following reasons what we describ on this lisitng page. Voltage Plug Japan Voltage: 100V Please check your country's voltage before order. Buyer may need down transfomer to use our item, Because most of country's voltage is higher than 100V. Plug: TypeA Please check your country's plug. Buyer may need exchange plug. We can not accept return and refund if you broke item with these troubles. Menu Manual Language Our item has only Menu Manual in Japanese Language basically. We can not accept return nor refund with language troubles. About Us This is brand new item. It will be shipped from Japan after a quality check by a Japanese staff. Product takes 14 days about 24 days to arrive. If the items come with lithium batteries, the item will pre-fitted with the batteries on shipment. International Buyers - Please Note: Import duties, taxes and charges are not included in the item price or shipping charges. These charges are the buyer's responsibility. Please check with your country's customs office to determine what these additional costs will be prior to bidding/buying. These charges are normally collected by the delivering freight (shipping) company or when you pick the item up - do not confuse them for additional shipping charges.